The Holliday lab’s research focuses on structural and functional relationships of vertebrate organ systems to determine their ecological and adaptive significance. 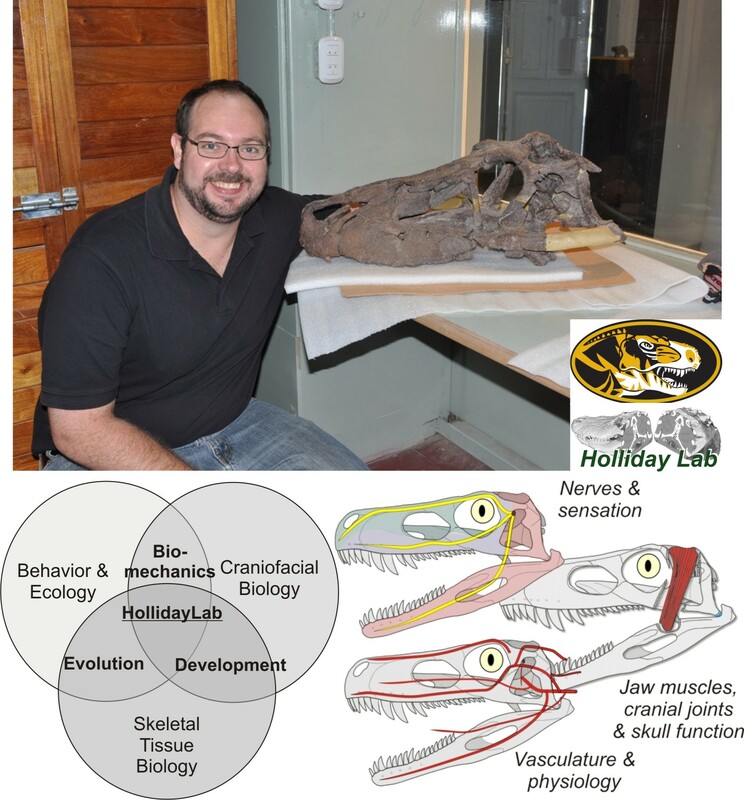 We use the fossil record, biomechanical analyses, and experimental methods to answer questions about craniofacial biology, skeletal tissue physiology, and feeding function, behavior, and evolution. In particular, our research focuses on elucidating the relationship between structure and function in archosaurs, the group of vertebrates that includes crocodilians, birds, and dinosaurs. We employ classical anatomical techniques (e.g., dissection, vascular injection, histology) integrated with 3D-imaging techniques (laser, CT, confocal) and biomechanical modeling applications (e.g., finite element analysis, multibody dynamic analysis, animation), set within this broad phylogenetic framework. 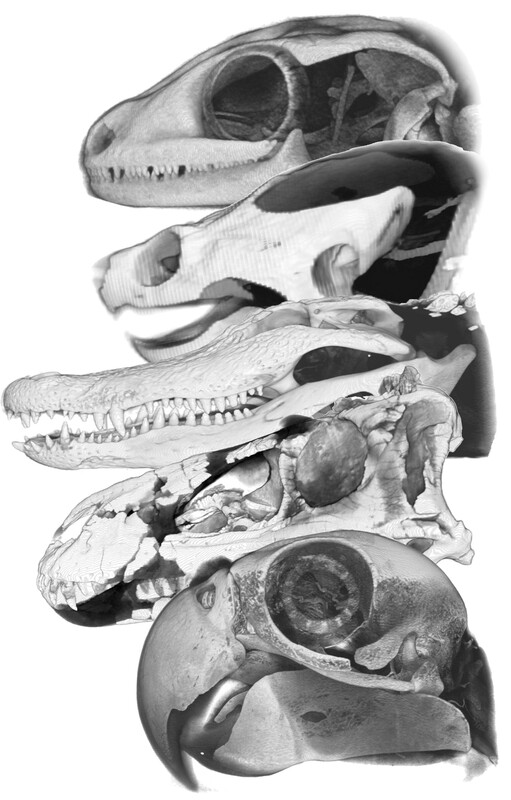 Using this anatomical foundation we can more accurately analyze cranial function and evolution in living taxa such as lizards, crocodylians, and birds, as well as test functional hypotheses in fossil dinosaurs, crocodyliforms and stem groups. These living clades offer enormous diversity in trophic form and function, shedding light on ecomorphological and biomechanical patterns that pervade vertebrate evolution. We are heavily engaged in training the next generation of scientists. We take full advantage of the lab’s unique focus to promote and inspire inquiry among students of all ages. We develop and host educational classes, workshops and online modules for K-beyond groups through our Inside Dinosaurs STEM education & Outreach Program. We run the Annual Dinosaurs & Cavemen Science Expo every Spring at Rock Bridge High School in conjunction with the Columbia Schools Planetarium. This is an exciting event that shares hot topics and research with the community through a host of activities and displays. Emerging from much of this work are refined, interactive 3D models of vertebrate anatomy. We are working towards providing as many of them on the web as possible. In particular, check out the ever-evolving 3D Alligator and Lizard chin pages as well as the digital media associated with Shieldcroc (Aegisuchus witmeri). Our integrative methods present a thorough and modern view inside animals– living or extinct. We collaborate with systematists, biomechanists, developmental biologists, ecotoxicologists and numerous other researchers. The Holliday Lab is in the Department of Pathology and Anatomical Sciences at the University of Missouri School of Medicine. We are members of the Integrative Anatomy Graduate Program and the Veterinary Pathobiology Area Group at the University of Missouri. Check us out!